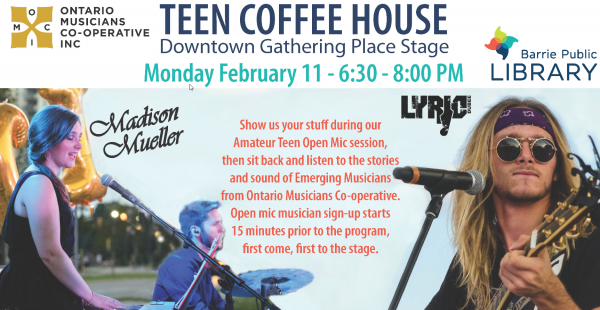 Show us your stuff during our Open Mic session, then sit back and listen to the stories and sounds of Emerging Musicians from the Ontario Musicians Cooperative. Take the stage and get experience performing for a live audience! Ask questions and learn more about the music industry, how to develop your sound and discover the City of Barrie Emerging Musicians Program. Performers in Grades 7 to 12 are invited to sign up at 6:15 pm, first come, first served. Café will be open for refreshments.